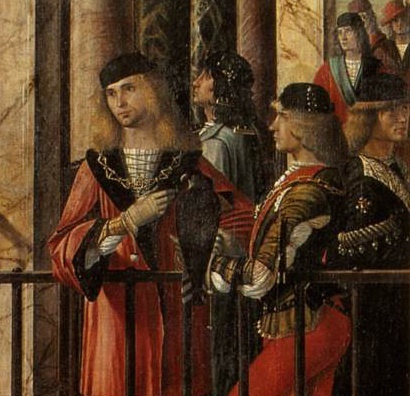 Carpaccio's "The Ambassadors" (c.1490) shows how men's chemises, too, were on display. Showing your chemise in historical costume is, I guess, a bit like the fashion for showing your underwear today. But with style! As societies moved into the later part of the 15th Century, clothing and costume became more fitted. People of the Renaissance and the Humanist Movement began to appreciate the beauty of the human form (as the classical forms depicted in Ancient Greek and Roman art began to be rediscovered and appreciated again). The shape of the body became a thing of beauty, rather than a thing of shame (in spite of religious beliefs to the contrary) and the younger, fitter generation, wore clothes which showed this change in attitude. The shift of the mind… and the "shift"
You see it mainly in the upper classes in renaissance art: A shift towards showing your chemise (or shirt, or shift) as part of the design or style of your outfit. The chemise still served a practical purpose. It kept the dirt and sweat away from the inside of your clothes so you didn't need to wash them so regularly. Remember it was a time when water had to be brought from a well or a point on an aqueduct (Roman aqueducts were still serving some parts of Europe at this time, if they had been maintained or survived well enough). Before the dawn of the Renaissance, the only clean linens you wanted to show were the pristine ones on your head (a sign of purity particularly in women). Now the chemise became more voluptuous (using up to four metres of fabric, instead of two). It was allowed to poke from the elbows and cuffs of sleeves (usually "puffed" through ties, as in the paintings I've included here), or even from the underarms, and between the lacings at the front of a doublet or bodice. 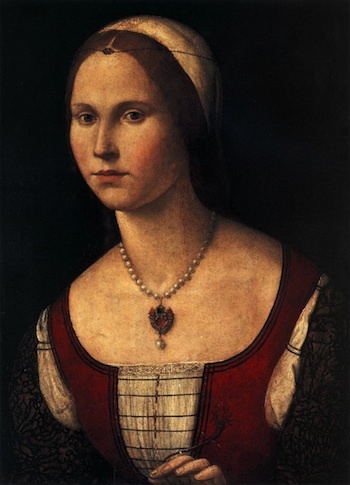 Carpaccio's "Portrait of a Young Woman" (c.1495) shows the chemise at the front and armscyes of the gown. Why was this a sign of wealth? White linens get grubby very quickly. It doesn't matter how idle your life is, dirt will get on your cuffs and elbows, and show at the neckline as well. Especially on dusty streets. Showing your chemise was a sign you could afford to have more clothes. Maybe not so many gowns, but you could have more linen shirts. And you could afford to have your shirts washed every day or two. It was also a sign that you could afford more fabric, since the amount used in the garments had doubled. At the lowest end of the feudal class system, the shirt or chemise remained a simple garment made from minimal fabric. There is little doubt that showing your chemise is a fashion statement. It's one of the prettiest styles in history, and one which is revisited down the following centuries. We see it in the Italian Renaissance revival of the early 19th Century - the Empire line of gown is based on Venetian styles of the late 15th Century, and was revived again in the 1910s, the 1960s, and the 1970s. It's a simplified form of the ancient style, but the origins are clear.